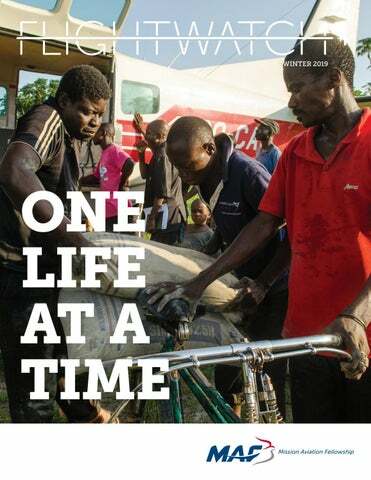 a publication of Mission Aviation Fellowship The stories within FlightWatch are highlights of MAF’s ministry. Some days our missionaries get to see and experience the amazing things our Lord is doing. Other days are spent quietly and diligently serving the Lord through routine flights, maintenance work, and simply living among others in foreign countries. We believe that God works through all areas of service and at times blesses us with extraordinary glimpses of His work. MAF maintains the highest standards of financial accountability and public disclosure to donors, the government, and the world at large. MAF is a member of ... Accord (formerly AERDO) • CSC Christian Service Charities • ECFA Evangelical Council for Financial Accountability • IAMA International Association of Missionary Aviation • Missio Nexus. All Scripture references, unless otherwise noted, are taken from THE HOLY BIBLE, NEW INTERNATIONAL VERSION®, NIV® Copyright © 1973, 1978, 2010 by Biblica, Inc.™ Used by permission. All rights reserved worldwide. YOU CAN BRING HOPE TO ISOLATED PEOPLE! Combine your unique skills with your passion to share the love of Jesus crossculturally by going overseas with MAF. Many opportunities are available in remote places around the world. MAF needs people like you to serve as pilots, maintenance specialists, tech resources specialists, and teachers. Find out how you can serve by visiting MAF.org/serve or emailing an MAF mobilizer at mobilization@maf.org. A G L I M P S E AT H OW YO U H E L P M A F S TA F F L E AV E A L A S T I N G L E G A C Y.
arth Pederson, a long-time pilot with MAF, handed the keys to his motorcycle over to Dan Grings, who serves in the Democratic Republic of the Congo (DRC). Dan, a third-generation missionary, plans to use the bike to return to the place he was born in the northern part of the country, and go from village to village to encourage his remote church plants and do evangelism. Garth won’t need the bike anymore since he and his wife, Jody, will now be serving stateside with MAF. Jody passed along her keyboard to a Congolese man who leads a church in an isolated region of the DRC. The portable, battery-operated keyboard that Jody once used to teach music lessons, now allows Pastor David to lead his congregation and others in the area in singing praises to the Lord. The Pedersons are leaving a motorcycle and a keyboard in the DRC—but like many MAF missionaries, they are leaving behind much more than that. The impact MAF staff have is not always obvious, but the Pedersons got a glimpse of how God wove together their lives and others for His glory. for that aid created an emotional moment for me as those memories flooded back into my mind.” Today, Dieu remains a vital team member in Nyankunde, helping with building projects, airplane maintenance, and cleaning and upkeep of the hangar and airport grounds. PARTING BLESSINGS At the Pederson’s going-away party with their Kinshasa teammates, Kahindo Mbodwam, the wife of a new MAF pilot, shared how she and her husband were encouraged by reading the Pedersons’ prayer letters. Through them the Pedersons had painted a beautiful picture of the impact of MAF’s ministry, which motivated the Mbodwams during their long support-raising period to keep pursuing their goal of joining MAF. In what seems like a natural next step, Garth and Jody are now mobilizers with MAF. They’ll continue to impact a new generation of MAF pilot/mechanics and IT specialists and their families who are preparing for service. The Pedersons no longer own a motorcycle or a keyboard, but they do have the knowledge that what they left behind in the DRC is even more valuable. Because of the support of people like you, MAF staff around the world are leaving legacies that extend further than they could ever imagine. Special thanks to Jaclyn Reierson in west DRC for her help with this story. And you aren’t alone! Here’s a glimpse at how many people like you are involved with MAF in different ways. This support makes it possible for isolated people to be reached with Christ’s love. donors supported MAF’s work last year! ryan Eygabroad landed his Cessna 206 at the Lebakeng airstrip high in the mountains of Lesotho. He was unloading cargo when he overheard a group of nurses from the local clinic chattering excitedly in a mix of Sesotho and a Zimbabwean language. The nurse relayed to Bryan that a tragedy had struck the village the night before. A local woman had died shortly after giving birth. back to Maseru, he knew the nurses and villagers had worked out a long-term plan to care for the newborn baby. “I love that I got to be a part of this story,” said Bryan. “But it was really the national staff who were instrumental in this story’s success. I was ‘ops-normal.’ They took the extra step to make sure everything worked out.” “I have seen God’s love through MAF,” said Oliphant. “I feel blessed to be part of MAF Lesotho, where our everyday jobs include saving the lives of the Basotho people in the mountains. I enjoy saving lives.” MAF would not be able to serve well in Lesotho without people like Oliphant and Tebello—nor could MAF share Christ’s love with isolated people around the world without the generous support of people like you who make stories like this possible! Is God calling you to join the Woodsums as they share Christ’s love in the DRC? 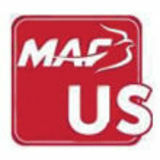 To become a partner in their ministry, visit maf.org/woodsum. llan Bagge was flying his airplane in northern Idaho in 1987 when he tragically crashed—he did not survive. Lois, Allan’s wife, was determined to honor her husband and bring closure to his death. “My mom wanted to fund an MAF airplane,” Ronn Bagge explained to a room full of donors, staff, and mission partners at a recent event at MAF headquarters. “MAF was very responsive and gracious to my mom as they met with her and understood what she wanted to do.” Lois gave a gift to MAF, and by 1989, a Cessna U206G had been acquired and was being used in Venezuela. This first gift was the beginning of the Bagge family’s relationship with MAF—the first generation of supporters from this family. Ronn picked up the baton next, and hopes his own sons and daughter will also catch the vision of partnering with MAF. Rolland Trempert, MAF’s director of Aviation Safety/Quality, was surprised to hear Ronn speak at MAF. The Bagge family had donated the very plane he flew in Venezuela. “I remember seeing the plaque on the glove box, with the name ‘Bagge’ on it,” said Rolland. “It was a somewhat unusual name, so, memorable.” Rolland did field training with four new pilots in that plane. Each eventually was able to fly solo and go on to serve with MAF in Venezuela. “Since much of our ministry was direct missions support, we carried LOTS of cargo. The airplane could carry 100 kg more (25 percent) than the program’s C185s,” said Rolland. “It was a big improvement in the ability to meet the need.” That airplane was used in Venezuela from 1989-2005, flying about 10,000 hours. When the program closed at the request of the government, the aircraft was used for recruiting purposes in the midwestern U.S. Then it was sold to an ex-MAF staff member in the Portland, Oregon area, who makes it available to future mission pilots so they can gain experience flying a C206 before they serve overseas. God took one gift, born out of tragedy, and used it for good— to bring Christ’s love to isolated people, train pilots, and inspire giving across multiple generations of one family. Get your free and confidential Estate Planning Guide and discover how you can leave a lasting legacy. Call 1-800-261-7280 or email plannedgiving@maf.org. DRONE S Will drones make MAF obsolete? “Drones can be a complimentary tool to our existing aircraft,” said Danny Hulls, MAF application administrator and former pilot. “They would never replace MAF’s traditional aviation services, but they will be an effective tool.” Case in point: the drone airstrip survey. Every three years, pilots have to inspect all of MAF’s airstrips (other than major, Class 1 airports). This requires the pilot to walk the airstrip—a laborious task. Danny has been working to use drones to provide an aerial view to streamline this process. The drone flies high into the sky and takes around 250 high-resolution pictures that are stitched together and overlaid on Google Earth. This allows MAF staff not only to get a detailed, bird’s eye look at the airstrip, but also lets them see how the strip is changing over the years— e.g., tree and vegetation growth, buildings, roads, etc. “This would make airstrip surveys much less time-consuming,” said Danny. And drone airstrip surveys are just the beginning. The possibilities for MAF to use drones are endless. “Down the road, drones might be able to deliver and pick-up packages, and bring medication, vaccines, blood samples, passport stamps, and more to remote locations,” said Danny. “The biggest potential is for reaching areas that don’t have an existing airstrip.” There are some things the drone won’t be able to do such as measure the softness of the airstrip, which is especially important in places like Papua, where the soil isn’t as dry as in Lesotho. And when it comes to building relationships and sharing the love of Christ, a drone is no match for an MAF pilot. Please continue to bring before the Lord the people of the Philippines and Indonesia who were affected by recent natural disasters. Lift up Zacharie François, a young Haitian MAF staff member studying aircraft maintenance at the School of Missionary Aviation Technology (SMAT) in Michigan. Give praise that a new airstrip opened at Itende, DRC, and pray for final approvals needed for the airstrip in La Source, Haiti. (See November issue for details.) May God use them to bring hope and healing and more opportunities to share Christ’s love. MAF WELCOMES NEW CEO In a ceremony on September 14, MAF inaugurated David Holsten as the organization’s ninth president and formally recognized outgoing president John Boyd for his service. The event was followed by the dedication of an amphibious Caravan that will eventually serve in Papua, Indonesia. AMBASSADOR VISITS MAF BASE The US Ambassador to Indonesia came through Tarakan, Kalimantan, in September. He made time to visit the MAF hangar and treat the team to dinner at a local restaurant. According to Kalimantan program manager Ben Eadie, “It was a neat opportunity to meet him and some of the folks who work out of the Embassy, and also to share with them why MAF is in Indonesia along with what we actually do.” Photo: MAF Tarakan staff and the ambassador (third from right). DID YOU KNOW? Pray for government approvals needed to complete avionics work on our Cessna Caravans in Papua, and lift up MAF mechanic Arleon Eko and other staff who are working on those avionics upgrades. MAF’s Disaster Response team, in partnership with Medair and Ethnos360 Aviation, delivered and distributed shelter kits and rice to more than 400 families in four communities along the isolated northeast coast of the Philippines, an area hit directly by Super Typhoon Mangkhut (Ompong). A few short weeks later, MAF collaborated with Ethnos360 Aviation and Helivida to bring aid to the people affected by an earthquake and tsunami in Sulawesi, Indonesia. Some of you have written or called to question why we write “an MAF” vs. “a MAF.” You might think that “an” should only be used in front of a word that begins with a vowel. But the rule is, if it begins with a vowel sound, then use “an.” Since we pronounce it as “M-A-F”, that makes the “M” sound like “em”, thus requiring “an.” Some of our European counterparts pronounce it MAF (rhymes with staff), so they would write “a MAF.” Confused yet?